"Empowering staff in new wine venture." The Five's Reserve wine range launched in 2005 was developed by Van Loveren and is 25%-owned by the De Goree Employees Trust. In a two-tiered and broad -based BEE (Black Economic Empowerment) deal, Van Loveren together with 116 of its staff and pensioners, have purchased a 139-hectare grape farm in the Robertson Wine Valley, and has signed a long-term contract with the trust for the supply of grapes to its cellar (at market-related prices). The wines produced are Chenin Blanc, Merlot Rosé, Pinotage, Cabernet Sauvignon - Merlot and a Brandy. With a label depicting the ‘big five' (elephant, rhino, lion, leopard and buffalo), the range proudly carries the South African identity and the best it has to offer. Appellation: Robertson. De Goree Farming is a proud partnership between the Retief family of Van Loveren Vineyards and their workers. All the grapes used to produce this Five’s Reserve range of wines come from the farm which is located in the heart of the Cape Floral Kingdom, home to more than 10 000 species of flora and aptly so, conservation lies close to heart. Part of the profit of every bottle of Five’s Reserve wine sold, is donated to the Southern African Wildlife College, who train conservationists to protect our natural heritage. This is an initiative founded by the WWF & Peace Parks Foundation. Flavours of cherry, ripe raspberries with hints of violets and spice, followed by a dry lingering finish demanding food. A blush-coloured wine with a fresh fruity nose. A lovely light, crispy summer wine to enjoy with seafood, salads and chicken. Screwcap. Recommended maturation potential: 2 - 3 years. Typical varietal guava and tropical fruit on the nose with spicy bruised apple, crisp dry palate and lingering finish. Fruity unwooded wine. A delightful summer wine to be enjoyed with salads, cold meat, creamy pasta dishes, chicken, veal and shellfish. Screwcap. Recommended maturation potential: 2 - 3 years. A complex nose of banana, cassis and strawberry is followed by refined layers of blueberries, vanilla and spice on the palate. Toasty oak with a soft finish. A medium bodied wine to be enjoyed with red meat, rich stews, curries and smoked foods. Maturation potential 5 years. Almond, succulent dark plums and mint on the nose, followed by ripe berry, cassis and red current on the palate. Good oaking ensures a soft, toasty finish. Has enough tannin grip for rich casseroles, roasts, smoked foods, pork or venison. Maturation potential 5 years. Drinking during pregnancy can be harmful to your unborn baby. In a two-tiered and broad-based BEE deal, Van Loveren, the well-known Robertson wine farm owned by the Retief family, together with 116 (of whom 52 are women) of its staff and pensioners, have purchased a 138-hectare grape farm in the Robertson Wine Valley. The farm, which is 52% owned by an employees trust and the balance by the Retief family, has signed a long-term grape supply contract with Van Loveren Private Cellar. This will render the farm profitable within its first year of operation. Simultaneously, in a joint venture with the trust, Van Loveren has launched the Five’s Reserve wine range, comprising a white wine, a rosé, two reds and a brandy, which will be marketed locally, to the tourist sector, and internationally. Early in 2006 the De Goree Employees Trust and the Retief family took transfer of the 138-hectare farm, De Goree, in the Goree district of the Robertson Wine Valley, although they had been farming there since May 2005. The beneficiaries of the trust are Van Loveren’s 104 existing and retired staff and 12 employees who worked for the previous owners of the farm. A grant from the Department of Land Affairs assisted with the purchase of the farm. De Goree farm presently has 49 hectares under vineyards, which will be increased over time as improved water rights are received. Van Loveren has signed a long-term contract with the trust for the supply of grapes to its cellar, at market-related prices. Hennie Retief, a viticulturist by training and Van Loveren’s production director will oversee the running of De Goree farm. The four trustees of the trust, Chrisjan Williams, Johanna Prins, Niklaas Prins and Maritsa Jansen, will all be involved in the management of the farm and the development of the Five’s Reserve range of wines. Van Loveren has a long history of staff upliftment and development. For many years now all staff housing has been fully serviced (running water, electricity etc); farm schooling was provided until community schools proved adequate; a ‘women’s club’ run by the Retief wives has been going for 15 years; comprehensive staff training is provided, etc. At the 2006 Rudnet Awards (funded by the SA Wine Industry Trust – SAWIT) for good labour relations, Van Loveren scored 87%. With the advent of the De Goree empowerment initiative, appropriate skills development, training and mentorship programmes will be established, particularly for middle- to senior management candidates. The Five’s Reserve wine range was developed by Van Loveren and is 25%-owned by the De Goree Employees Trust. The range comprises a Chenin Blanc, a Rosé, a Merlot, a Cabernet Sauvignon Pinotage blend and a 5-year old Brandy. As with all the Van Loveren wines emphasis will be on excellent value. The wine will be distributed through Van Loveren’s usual channels, and with the labelling depicting the ‘big five,’ the range will be targeted at tourist destinations, particularly national parks and game reserves. The wine will also be exported worldwide. In 2006 Van Loveren celebrated its 25th year as a wine brand. Wynand and Nico Retief launched Van Loveren wines in 1980 with 500 cases. In 2010, with the business being run by the ‘four cousins’ (Wynand’s sons Phillip and Neil and Nico’s sons Bussell and Hennie), production of the Van Loveren and Four Cousins brands is 1 000 000 cases, making them the largest privately-owned wine brands in South Africa. Part of their success is attributed to the strong focus on the local market, with less than 25% of the wine being exported. FMS is a wine négociant and international trading house focusing on the export of wines since 2000. 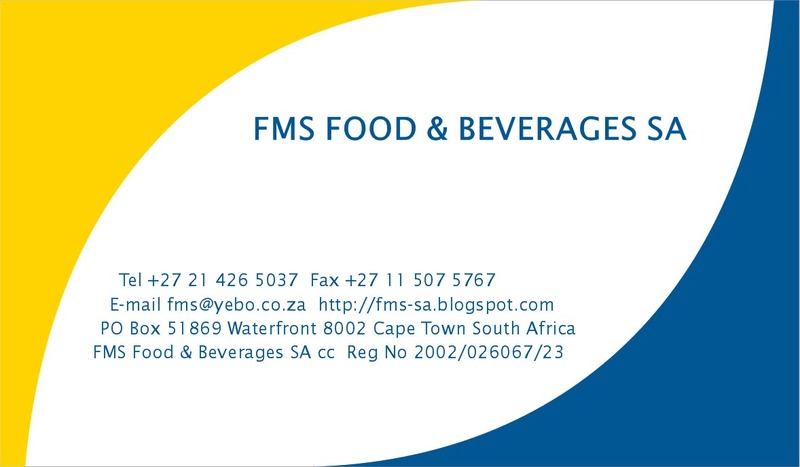 FMS offers a full CIF export service, while FOB Cape Town prices will enable you to consolidate your order with current suppliers in South Africa. FMS has built up a portfolio covering Empowerment (both Five’s Reserve and New Beginnings are Black Economic Empowerment brands, Five’s Reserve is Fair Trade registered); the Environment (Van Loveren is a Biodiversity & Wine Initiative member, Five’s Reserve contribute to the World Wildlife Fund and the Peace Parks Foundation); and Health (Four Cousins have two wines endorsed by the Weigh-Less Foundation). FMS exports successfully to various clients based in Europe and the Far East. Our clients trust our judgment absolutely, rewarding FMS with consistent word-of-mouth advertising, and making us their only choice when considering adding new brands to their portfolio. Thanks to our professional approach, our client in Japan has chosen FMS rather than dealing with the cellar. 4 sales in 4 months thanks to GWS! FMS est un négociant du vin et la maison de commerce internationale se concentrant sur l'exportation de vins depuis 2000. FMS offre un service d'exportation de CIF complet, tandis que les prix de FOB Cape Town vous permettront de consolider votre commande avec des fournisseurs actuels en Afrique du Sud. FMS a créé un portefeuille couvrant la Responsabilisation (le Five’s Reserve et le New Beginnings sont les marques de « Black Economic Empowerment », Five’s Reserve est enregistré à « Fair Trade »); l'Environnement (Van Loveren est un membre de « Biodiversity and Wine Initiative », Five’s Reserve contribue à le « World Wildlife Fund » et la « Peace Parks Foundation »); et la Santé (Four Cousins a deux vins approuvés par la « Weigh-Less Foundation »). FMS exporte avec succès aux clients divers a basé en Europe et l'Extrême-Orient. Nos clients ont confiance en notre jugement absolument. Ils récompenser FMS avec publicité verbale régulière et faire nous leur seul choix en considérant l’addition de nouvelles marques à leur portefeuille. Grâce à notre approche professionnelle, notre client au Japon a choisi FMS plutôt que faire un marché avec la cave. 4 ventes dans 4 mois remercient à GWS!